The NFL coaching carousel is an interesting ride every year. “What have you done for me lately” is the only common theme. 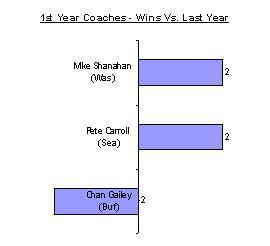 With as much flack as Mike Shanahan has received this year as first-year coach of the Redskins, you’d think he completely bombed. But he actually improved the team by 2 regular season wins this year. Same goes for coach Pete Carroll of the Seahawks. Chan Gailey of Buffalo hasn’t had as much luck. He finished with 2 fewer wins this year. Lucky for them, all retained their jobs for the time being. Three coaches with only two full seasons under the helm of their teams got the ax already. Cable, Mangini, and Singletary were all relieved of their duties. But who deserved to get fired? Here’s the same view for sophomore coaches (red indicates already fired). Jim Caldwell should be thanking his lucky stars he still has a job. His team is 4 wins worse than last year, and they’re really 6 wins worse when you consider that he benched Manning for the last two games last year to prevent injuries. But his team still made the playoffs, so he still has a job. Tom Cable stands out as completely the wrong coach to get fired. He’s a victim of Al Davis’s craziness, not his actual coaching ability, as the Raiders are on the right track. However, considering his off-the-field issues, it’s not a complete surprise. Manginious was not making any progress in Cleveland. 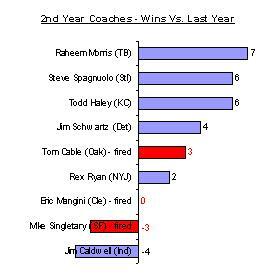 Holmgren wasted a year by retaining him. Singletary was a disaster. One of the interesting things is the relative success that some of the sophomore coaches are experiencing. KC made the playoffs, and St. Louis and Tampa Bay were one win away. Detroit is no longer the laughing stock of the league. I’ll check in next year to see which coaches are still around.